As dog owners, no matter where we’re living, we know that our dogs are going to hear a noise, see an animal or person and get the urge to bark. Some dogs have much more distinct barks than others. Even though we love our furry companions, we know that these loud noises can disrupt our friends, family and most importantly, the neighbors. Sometimes our dogs are too old to learn not to bark. Sometimes their breed is just too feisty! So, how do you fix this problem? As it turns out, there are many ultrasonic bark control devices out on the market today. Maybe even too many! We know that making the tough choice to find out which one is the right for you can be daunting, so instead, we’ve done it for you! Here is an examination of finding the the Best Outdoor Ultrasonic Bark Control Device! First Thing’s First: What Is An Ultrasonic Bark Control Device? An ultrasonic bark control device is a small machine that can be placed in any backyard or room in the house. These devices can detect a dog’s bark up to 50 feet with the use of an internal microphone. Once the machine reads your dog’s bark, it will emit an ultrasonic noise (undetectable by humans) that bring safe discomfort to the dog. This should make your dog associate the noise with over-barking and prevent them from making too much noise. What Are The Benefits Of An Ultrasonic Bark Control Device ? Your world will be both quieter and less stressful with the installation of an Ultrasonic Bark Control Device. Believe us, your neighbors will thank you. My sister has two dogs, one being a purebred Beagle. Even though he is the sweetest little buddy, his bark and howl are nearly ear-splitting. Almost any noise, person, dog or bird will set him off, and sometimes it seems like silence is abnormal in her little apartment. Not to mention she has many neighbors both next door, above and below her. There have been many nights where my sister’s little Beagle would disrupt or annoy those around her. If my sister were to install an Ultrasonic Bark Control Device, she, her husband and her neighbors would get a little more peace out of their days and nights. Another advantage to installing these devices would be to teach your dog that not everything warrants a bark or howl. You will sleep easier knowing that your canine companion can be in the yard on their own without startling the neighbors or the local wildlife. It may even reduce stress, as they will no longer feel the urge to get loud and crazy over every little sound or person. What To Look For In An Outdoor Ultrasonic Bark Control Device? One concern that pet owners may have about these devices are whether or not it is safe for their dogs. 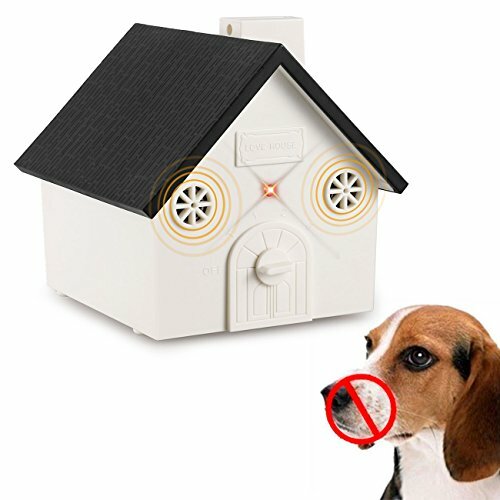 Even though the device emits an uncomfortable noise to the dog, as soon as barking ceases the device will shut off. They are not meant to be harmful, but instead annoying to your dog. Most of them have safety features, are easy to install, and even have volume or range-control. This is great for the concerned pet owner because you have all the power at your fingertips. If you want to give your dog a little time to bark throughout the day, not problem! Just turn it off! Other great features to these devices are that they can take on the form of decorations. Some Ultrasonic Bark Control Devices resemble small birdhouses, little stereos or even rocks outside. Some look like dog bones and would make great shelf decorations for your pet-friendly home or space. There are even models that can be weatherproof and durable for any backyard. However, you should always strive to store your electronics in a dry, safe place. Popular devices can cover a range of over 50 feet in diameter, which will allow even the biggest backyards plenty of coverage. They are even adjustable, so if you would like to keep your device indoors, you can reduce the range to as low as 15 feet instead. It’s all up to you! Will The Device Really Affect My Dog’s Behavior? Even though each dog is different, there is a great chance that your dog will be positively influenced by these devices. Because the device is meant to simply emit an annoying noise, your dog may choose to stop barking in order to quiet the device. Any dog that is not hearing impaired or deaf may eventually learn that excessive barking may cause them discomfort or annoyances, and therefore affect how they behave outside or inside. You may even quiet the neighbor dogs that disrupt your own dogs, which could reduce stress to shy or skittish pets. When the device is on, the dogs are still excited to see their owner but are much quieter than when the device is off. Even though the battery requirements of the device can get a little pricey, the owner agrees that for the time that they have the device their lives are more peaceful. You can definitely see in this video how the device may improve the lives of both you and your pets. What Is The Best Way To Use An Outdoor Ultrasonic Bark Control Device? When using the device outdoors it is best to store your device in a safe place. Even though most devices are built to be weatherproof and sturdy, you’ll want to make sure you’re keeping it as safe and dry as possible. Hanging it underneath the porch roof, near the shed, or perhaps off the garage might be your safest bet. However, you also want to make sure that you are placing the device where it can reach the area where your dogs will be playing or wandering (around 50 feet in diameter). If you are placing the device inside, you probably won’t have to worry about that. Another thing to remember is that each device can use up a lot of battery life. Make sure you are changing out the batteries so that the device will continue to work as it should. Finally, you’ll want to follow your setup instructions thoroughly to prevent misuse or improper installation. Not only is this design a sleek, modern black and white (it also comes in other colors), but it also resembles a charming birdhouse. The dimensions of the product are 2.3/4.7/6.7 inches, which make it small and easy to nestle away on your porch, hanging from a sturdy tree or next to the garage. Your neighbors and family won’t even notice it! This device claims to have an adjustable range, which is a huge bonus. You can have as little as 15 feet or as much as 50 feet of range for your pets. There is also a test-level that conserves the 9-volt battery life, and you can turn it off whenever you wish. All these features are done with a dial on the back of the device, rather than by a remote control. The material of this device seems sturdy and effective at keeping out wind or rain, however it is always a good idea to keep your electronic devices in dry, safe places. This device is cheaper than the last, but its overall design is just a simple black box. While you may be able to hide this in the garden or on the porch, it is less fashionable than the birdhouse models. It also appears to be made of a cheaper plastic and has less-sturdy materials for hanging it up. The simple plastic construction of this device could suggest that the material is not as sturdy as other models, and therefore should be stored somewhere dry and safe. This product does specify its requirements for batteries, though I assume it is looking for a 9-volt as well. This is the bulkiest bark control device which is tree log-shaped and brown in color. This could easily blend in with the walls of your home or placed in your yard if you have large trees. There is an adjustable dial that suggests that the range of the device can be changed or adjusted up to 50 feet to suit your specific needs. The device operates on a 9 volt battery. This device is of higher quality than others, but also looks to be made of thin plastic that may not stand the test of time. It boasts that it is weatherproof, but its small size and plastic covering may need to be kept out of any wet spaces. Another thing to remember about this device is that its thick frame may make it harder to carry or keep it safe if you leave it outside for too long. 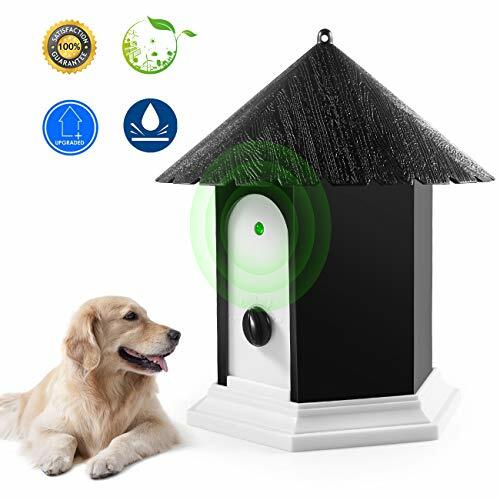 This outdoor ultrasonic bark control device from Gshine is uniquely designed. The device is especially designed for outdoor use and is waterproof. 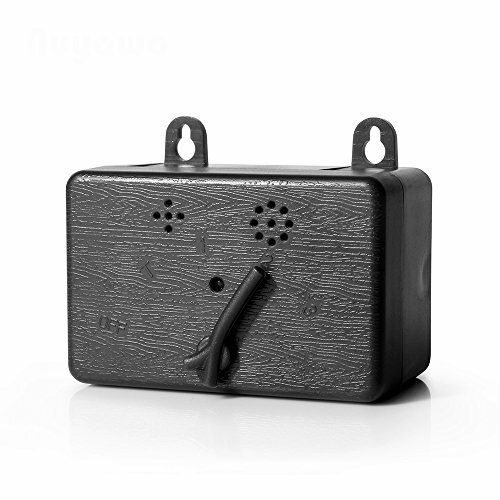 In what appears to be a durable design and construction of the other black box product, this one comes with more features and is just as affordable as others. The device runs on lithium ion battery. It features a microphone for picking up dog barking sounds, a knob to to adjust the sensitivity of the device and a speaker to emit ultrasonic sound to help stop dog barking. The range of this device can be adjusted up to 50 feet. 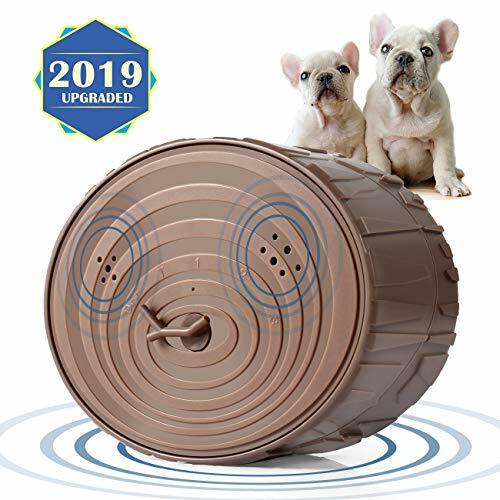 This ultrasonic anti barking device helps to stop your dog from barking, can be used for multiple dogs, and can even stop your neighbors’ dog from barking. With Gshine Ultrasonic Bark Control Device you get to have peace of mind while your dog stays quiet. It is easy to mount outdoor and would be good as an indoor device, which would allow you to use for a short time while you see if it is right for you, rather than spend a lot of money on something you do not like. Just like the other birdhouse, this model has a great style and decorative potential. It only comes in black and white, however, and it is slightly larger than the first one on this list. However, it appears to be just as sturdy. Going up to 50 feet, this birdhouse will be able to tackle the entire yard. However, unlike its other birdhouse counterpart, this device doesn’t have an adjustable range. It does come with a hanging rope in order to place it somewhere in your yard or home and appears to only require one 9-volt battery. When it comes to picking the perfect barking solution for you and your beloved pets, it can be hard to choose between so many options. In the end it comes down to personal preference, but there are also some things to consider. 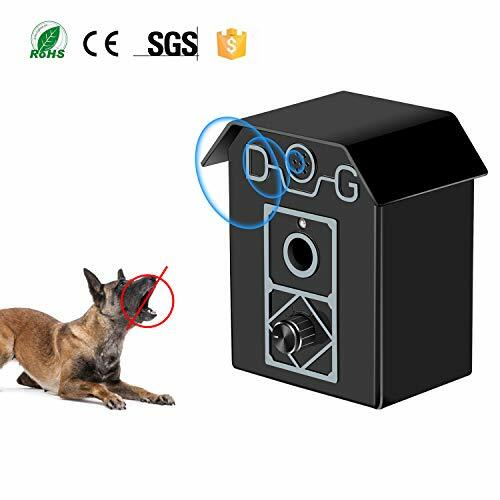 Of the five products reviewed, the best one for me was the Meter.llc outdoor ultrasonic bark control device in terms of good quality and reliable, consistent function. Even though it has a bigger price tag, its construction and aesthetic outweigh the extra cost difference between all products. In addition, although it is similar to the other birdhouse option, this model has an adjustable range that the other does not. Most importantly it seems as if it will be stronger and more reliable than the black boxes or green bones out there. This birdhouse version is cute, small and comes with great features! For my sister’s hounds, who could use an Ultrasonic Bark Control Device, I would probably be wrapping this one up for Christmas.